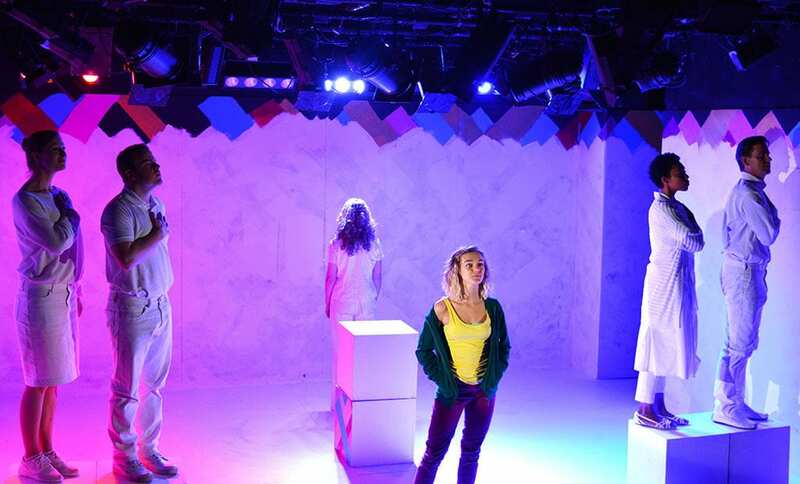 Theatre 503 is currently showing new play I and the Village by Silva Semerciyan which has been shortlisted for the Bruntwood Playwriting Prize. The drama focuses on the character of Aimee Stright (Chloe Harris), a girl from small town America who in an act of rebellious desperation enters a local Church with a gun. The story flashes between the events leading up to the incident and the aftermath. The box like stage daubed in colourful graffiti partially covered up with white wash paint is reflective of the claustrophobia Aimee feels. She continually spray paints and doodles on the walls as the show progresses and she is the only character dressed in colour. All her co-stars are dressed in white, all the props are white and they even paint white paint over her creations at the end of the show. The only colour comes from Aimee a choice which indicates her centrality to the plot but also her own sense that she is different from the bland people and the town she feels trapped in. The focus on the character of Aimee is largely successful, Chloe Harris handles the surreal prose excellently; creating a character the audience believes in and feels sorry for. The narrative is deliberately disjointed with large gaps missing from the story and this works to hook the audience’s interest, hoping their questions will be answered further down the line. 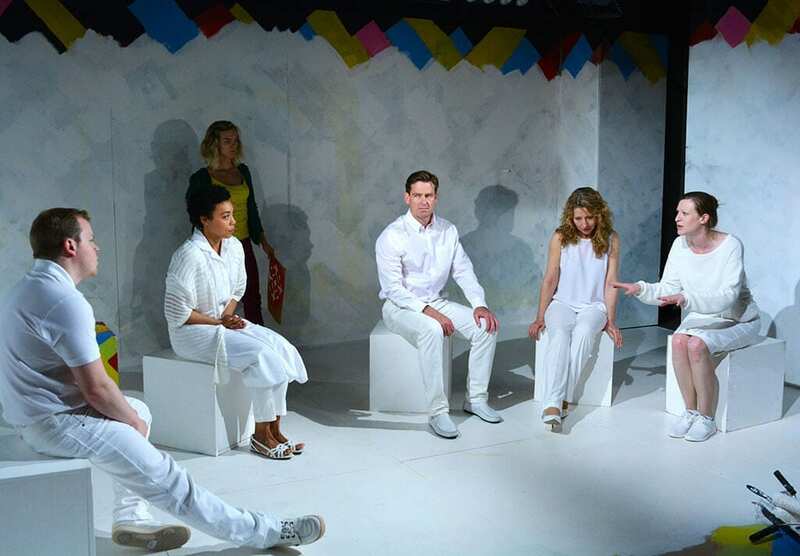 The ensemble characters dressed in white who play multiple parts are completely overshadowed by Aimee, who is largely much more interesting than them. This is quite a good trick, reminding the audience of Aimee’s sense of her own superiority, but also means all the other characters are slightly dull to watch. The script erratically flits between scenes and characters often leaving dialogue hanging and characters left half-formed. They do serve however to reveal that Aimee’s problems don’t always stem from herself, she is often wronged by the people closest to her and her increasingly erratic and ultimately dangerous behaviour is linked to her increasing sense of isolation as first one, then another and another adult lets her down. 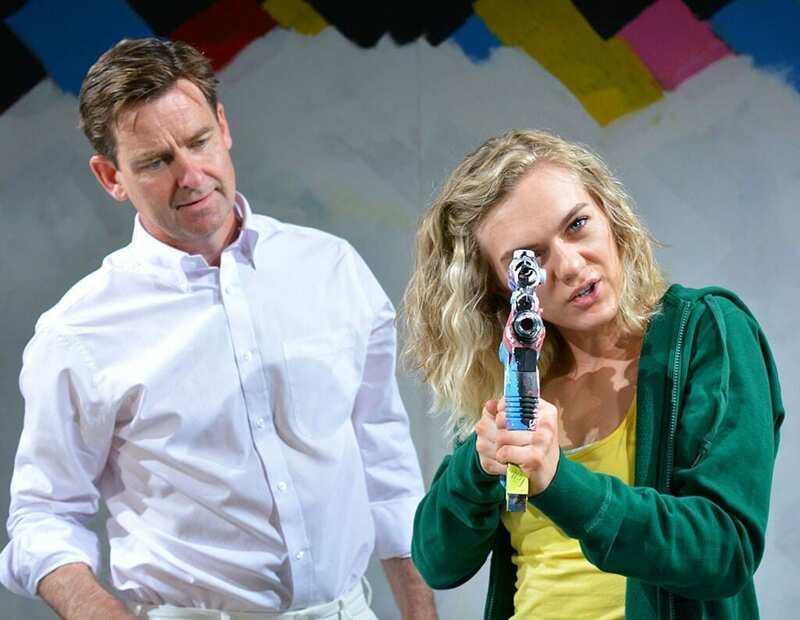 Aimee is an angry young woman who is intelligent and vulnerable and this interesting play presents her story as a way to examine American culture, particularly its obsession with guns. 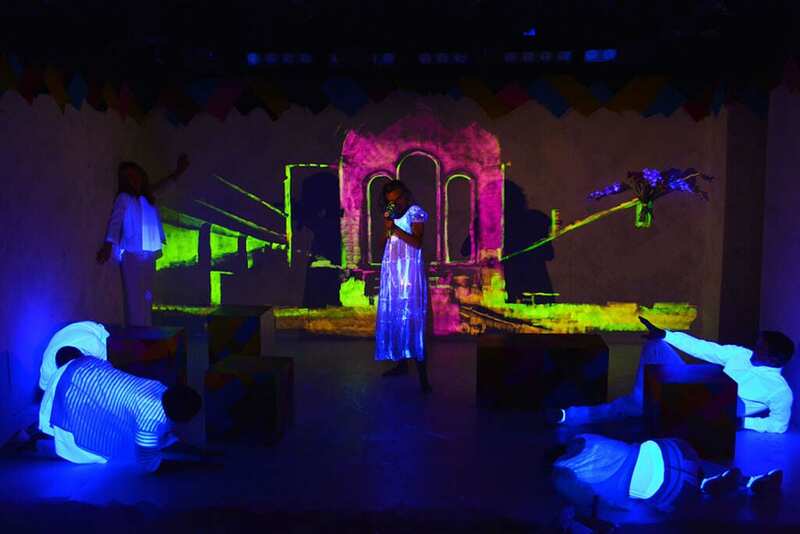 Ultimately the surreal and disjointed script and staging has the effect of cutting off a sense of drama before it builds enough momentum to be emotive and as a result the production falls flat in places. That said Harris’s performance is outstanding harnessing the youthful and explosive energy which ultimately leads Aimee to tragedy.